The Greater New York Region of the Antique Automobile Club of America, cordially invites you to become a member. It is not mandatory to own an antique car. The only prerequisite for membership in the Greater New York Region is membership in the National Antique Automobile Club of America. Get the National AACA Membership Application. Membership dues are $20 for the year, and $35 for the Antique Automobile Club of America, our national organization. 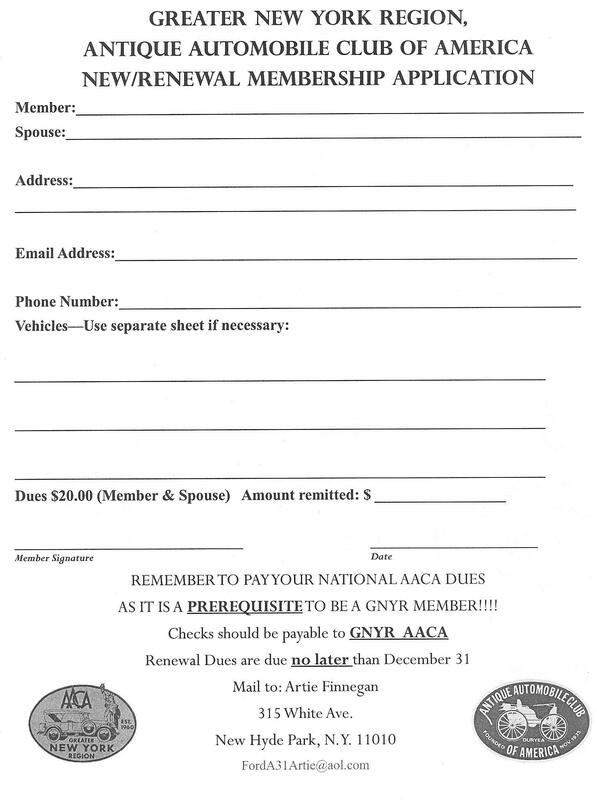 You must be a member of the national “The Antique Automobile Club of America” in order to be a member of the G.N.Y.R. as per our by-laws and the A. A. C. A. Also as a stipulation of our by-laws: “The applicant shall be presented and introduced at a regular meeting before approval of application”. Make checks payable to: GREATER NEW YORK REGION, A. A. C. A.